Great pearls of wisdom by Gandhi ji inspire us all; but do we always live up to them? Not everyone can help everyone, but everyone can help someone. 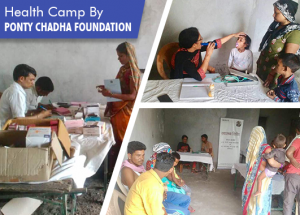 With the aim to provide better health services to the underprivileged, The Ponty Chadha Foundation serves the underprivileged rural areas of Uttar Pradesh by organizing free health camps every month. On 7th June, 2017, we organized the free health camp in Mehrauli, Ghaziabad. From its total population of around 3600, 154 people attended the camp, which comprised of 53 minors, 30 adults and 71 women. The health camp proved to be a success and we appreciate the efforts of the specialists from Dr. Ram Saran Garg (Indo-German) Hospital, who identified gynaecological problems, skin issues, anaemia and ear-specific problems as the major health concerns in the village. Health is a very important concern, which is majorly neglected in rural areas. Financial or social barriers prevent people from reaching out to seek help at the right time, and the Ponty Chadha Foundation strives to break those very barriers by working to support and provide the best healthcare to the rurals. We do our best to take our services to the masses, and our focus is to first reach the most disadvantaged sections of the society. At the health camp, we educate the rurals about maintaining sanitation, taking care of proper hygiene, cleanliness and other major issues that will help them live a healthier, happier and a more productive life. Improving access to health services brings a range of benefits beyond good health, as it helps combat poverty and provides a better world for all. This entry was tagged free health camp, health awareness, health camp in ghaziabad, health camp Mehrauli village, healthcare to the rurals. Bookmark the permalink.